Keeper and Gus are two other puppies from the KinseyHam litter, born 8/27/2005. They are brothers to our Teddy and Topper. Although Keeper and Gus don't live with us, they are being shown in conformation by Ronnie, and their owners are training and showing them in Obedience and Rally. Since they are mentioned so often in the News & Updates pages, they have their own page here for reference. Update: Keeper is a father! 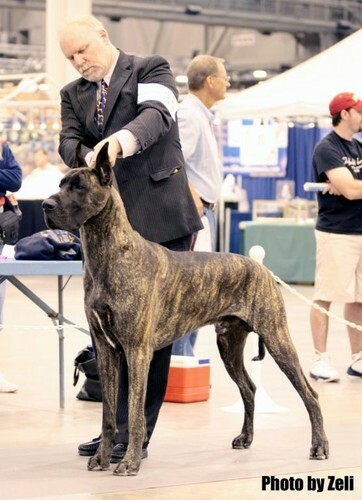 Bred in 2009 to Vicki Monson's beautiful girl Ch Calypso's Born to Hand Jive (Jazz). Update: We got a brindle girl from this Keeper x Jazz litter, named her Dakota and you can see her page here. We were all surprised (and pleased!) 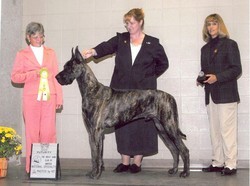 when Gus went Reserve Winners Dog at his first show in March 2006. He was just 6 1/2 months old. At the GDCA National Specialty in Topeka, KS in October, 2006 Keeper went third place in the big 12 to 15 month class of the Futurity! He was just 13 months old. 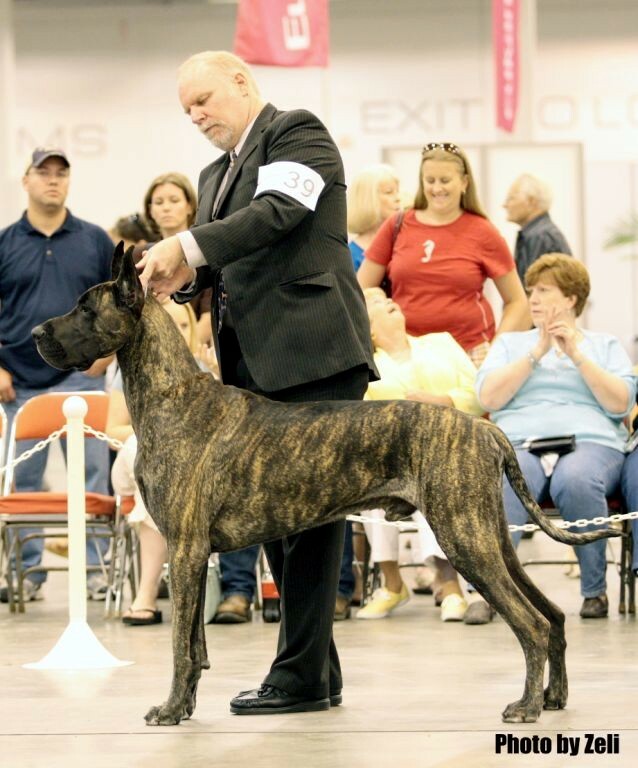 The Futurity is a special part of the National specialty - as the name implies, for Futurity classes the dogs must first be nominated (entered) before they are even born. A second nomination/entry fee is paid before they are 3 months old, and a final fee paid shortly before the National. 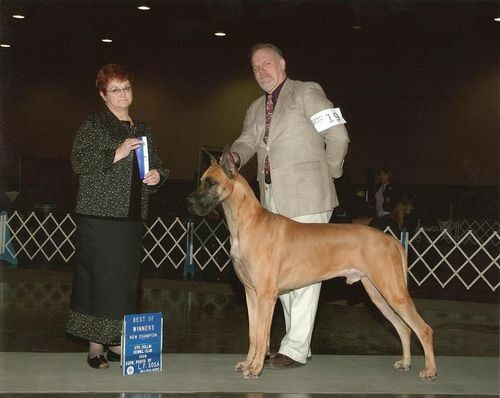 A breeder or owner can cancel a dog's nomination for Futurity by simply not paying any one of the nomination fees, if the dog doesn't turn out as well as hoped. But the first fee must be paid before the litter is born, which means the breeder really believes the litter will be an excellent one. 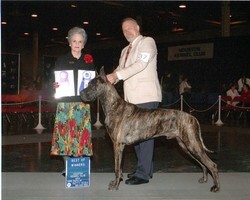 Keeper was handled at the National for his owner Karen by our dear friend Chantel Johnson, and she did a wonderful job! Gus won his first major in March 2007! More details on the "News & Updates, 2007" page. Keeper's first major win came in Houston in July 2007. You can find more details on the "News & Updates" pages. 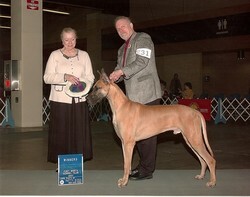 Jan 2008- Keeper becomes the first dog from his litter to finish his AKC Championship!! 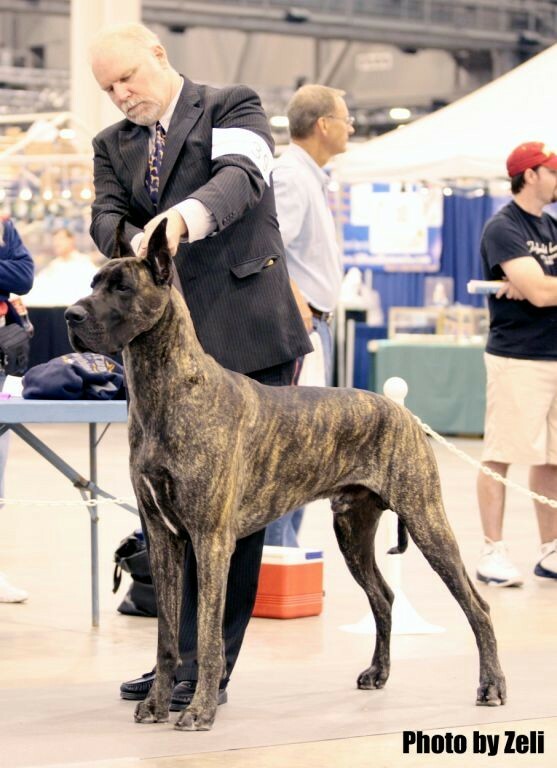 This lovely photo was taken in July of 2008 by our friend Zeli Schulte, and is one of the first times Keeper was shown as a "Special" - meaning being shown as a finished Champion, to try to get ranked within the breed. 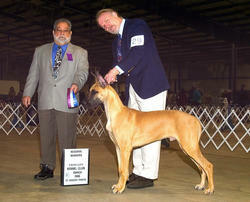 Jan. 2008 - Gus becomes the second dog from his litter to finish - just one week behind his brother Keeper!! He is now Ch. Symmetry's Vrroom To Grow. Way to go, Gus and Ronnie! !